Please enter your e-mail address here to receive information about the show. "Claimed as a Star wherever he goes...."
Roger Dean has spent a lifetime in the entertainment business as a singer, actor and cruise director. He made his television debut at the age of 14 for the BBC on a show called 'All Your Own' and then performed on several radio shows singing Johnny Cash songs. On the subject of Cash, he knows the score. All this in an era when not many people in the United Kingdom had even heard of Johnny Cash! Like Johnny, Roger is gifted with a "storytellers" voice. Who better to pay tribute to this great artist and to celebrate his legacy? Born in Birmingham, where he studied Music and Drama, Rogers' career has encompassed every corner of the entertainment business. He started at the famous Birmingham Repertory Theatre in productions of 'The Quare Fellow' and 'Toad of Toad Hall'. Chart success followed as one half of the pop duo 'Earl & Dean'. His first West End appearance was in the award winning drama 'Bent' starring Sir Ian McKellen and Tom Bell. He went on to entertain all over the world in cabaret and on cruise ships later becoming a Cruise Director for several leading cruise companies. He has toured every major theatre in the British Isles and has won acclaim for his fine performances in pantomime as 'The Dame'. 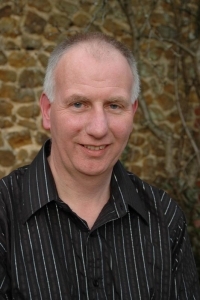 Based in Norfolk, Roger has spent the last 18 summers compering the nationwide talent show 'Search For A Star' at his favourite theatre, The Princess, Hunstanton. He also entertained a generation of children as the eponymous hero'Postman Pat'. The success of the show speaks for itself. Those who return time after time to some of the biggest theatres in the country never seem to tire of the production. The biggest joy in his life is being at home with Maureen, playing with Kirsty (his biggest fan) and walking his German Shepherd, 'Bella'. Warren can perform countless guitar styles with his country playing being compared to that of guitar legends Albert Lee and James Burton. 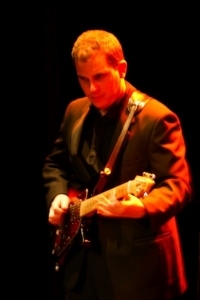 His musical career began when he joined the Lonnie Donegan Story as lead guitarist and he has worked as a busy session and touring musician since. The world of show business has taken him throughout England, Scotland, Ireland, Spain and Germany. Brian May of the rock band 'Queen' complimented Warren as a guitarist when the two performed together at a celebrity ball for the show business charity The Grand Order of Water Rats where he also had the privilege of working with many of his heroes, most notably, Bill Wyman, Joe Brown, The Blues Brothers Band and Gordon Giltrap. His love for the music of Johnny Cash brought him into contact with Roger Dean and he has been working with The Lazy Boys ever since (whenever his busy schedule allows) and his contribution to 'The Johnny Cash Story' is much appreciated by the fans of the show. Long may he continue! Steve Pycroft is a drummer, composer and producer based in Manchester, UK. In 2009 he completed a Masters in composition at the University of Manchester, where he also achieved a first class honours degree in music in 2008. Steve has performed with the Riot Jazz Brass Band who have recently recorded new material with Plan B (Ben Drew.) The band has also played at a variety of festivals all over the world. Recent appearances for Steve include Soundwave Festival, Croatia - supporting Cinematic Orchestra and Zero 7; Parklife Festival, Manchester - playing alongside Calvin Harris, and supporting Skream and Benga; The Warehouse Project, supporting Dizzee Rascal; and Kendal Calling - supporting The Streets and Goldie Lookin’ Chain. Steve joined Roger Dean's Johnny Cash Story during 2011 and with a great musical back ground as composer, producer and arranger of a wide variety of styles, from orchestral to dubstep, we look forward to many good shows with him. 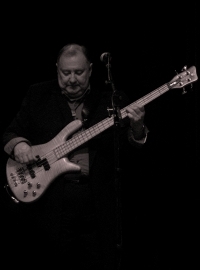 Bass guitarist Barry is the well travelled rock and blues man of the show who brings with him a wealth of experience since his musical career began during the 1960s. CAROL & THE ELECTRONS was the first band that Barry joined professionaly and they certainly were 'electro' as they went on to win countless competitions and embarked on endless tour dates. Throughout the 1970s Barry worked with the PAT GISSANE IRISH SHOW BAND a unit which went on to tour both the UK & Europe. 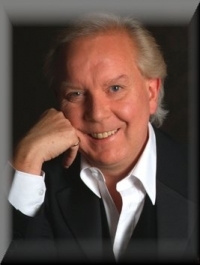 He then moved on to work with the INTERNATIONAL SHOW BAND were he was lucky enough to work with the likes of Neil Sedaka, Bob Monkhouse and Georgie Fame amongst countless other international stars. Andy was a great musician, a superb performer and a wonderful friend and remains forever in our thoughts.